Last night I was driving home in the 510, which is when I found out that turning the headlights on was causing momentary loss of engine power. Anyway, I heard a loud pop, something like a 22 rifle shot or a tire popping. I pulled over and checked the tires, they were fine. But the car wouldn't start, luckily I was on a hill and bump started it. (I had just gotten a jump start before heading home). The alternator is charging fine, I'll check the battery at the end of the day to check for drain. Um Nissan wasn't using those round connectors at that time. As in definitely not stock wiring. The only electronics in the car atm are the lights, and they work fine. That would have been really loud for a fuse, but that may be normal? I'm not sure, never heard a fuse blow audibly. 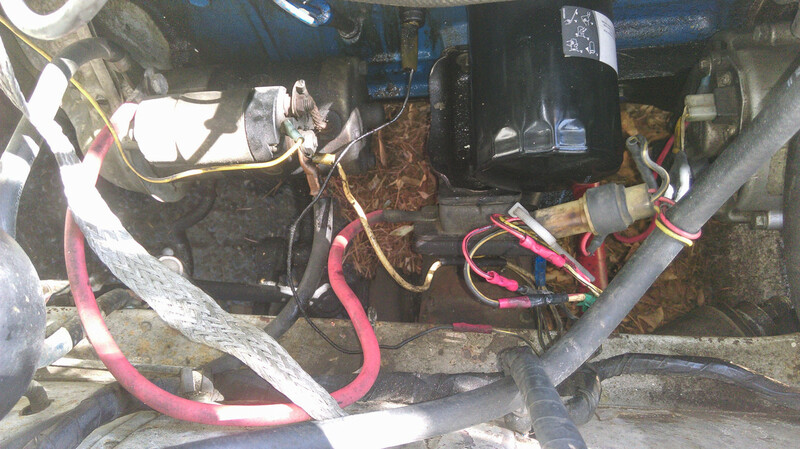 Would the alternator be newer or older than what should be in there? I wasn't able to find anything when I searched the numbers on the alt case. Also, the white plug in the back of the alt was unplugged before, but I just reconnected it. Internally or externally regulated? Also is there an external regulator on the inner fender? Laecaon wrote: Internally or externally regulated? Also is there an external regulator on the inner fender? The alt was putting out around 16V at the terminals, and pushing a steady 58 amps at idle. at the battery I'm getting about 14.3V, so There has to be some regulation in there somewhere, lol. I still hate electrical all just as much as then, but I've learned a few things along the way. Make sure all wires have a good connection, and check your grounds! Thanks for posting a conclusion. Threads with no final chapter are a pet peeve of mine.